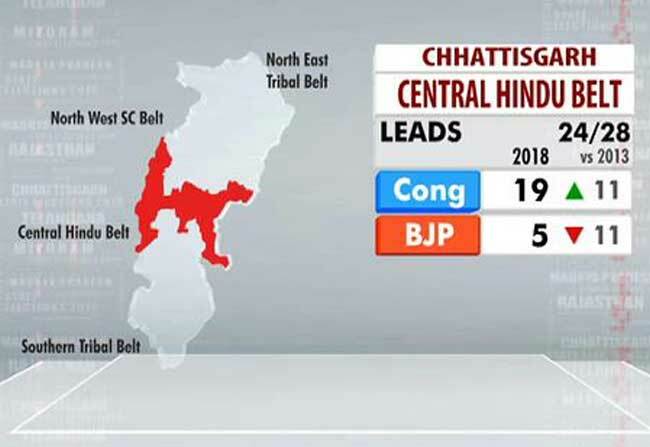 Chhattisgarh Election Result: The current trend suggests that the Congress will get 68 seats, up 29 from the 2013 elections. BJP, on the other hand will end around the 16 mark, a massive drop of 33 from the last time. It will not be a fourth consecutive term for BJP's Raman Singh. The chief minister has resigned as BJP is destined for a defeat in the Chhattisgarh Assembly elections. 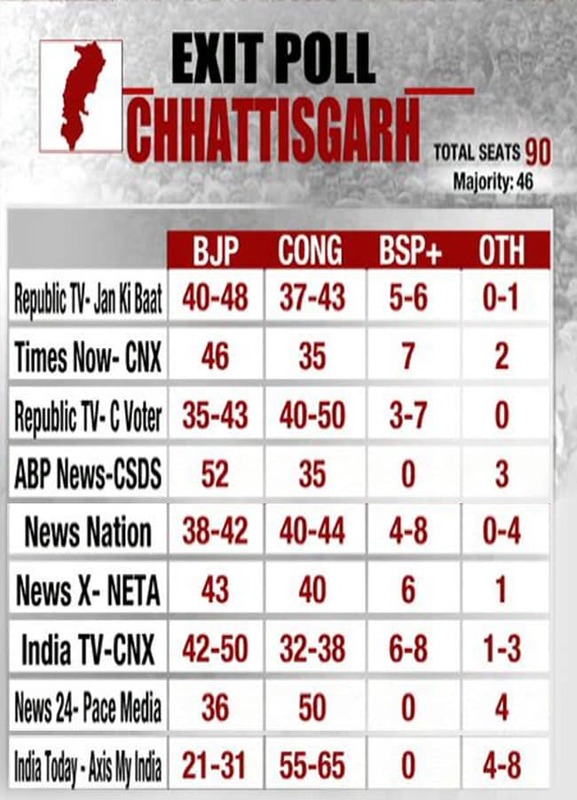 Congress is set for a landslide win in the Chhattisgarh elections. Voting happened in two phases to elect a new government in the state. 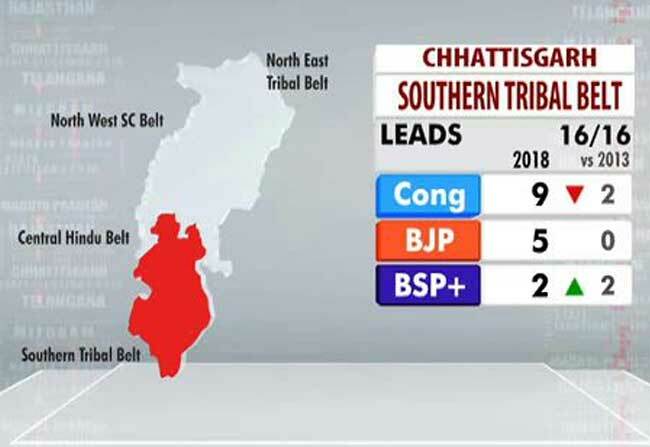 The Chhattisgarh Assembly, which has 90 members, has a current trend which suggests that the Congress will get 68 seats, up 29 from the 2013 elections. BJP, on the other hand will end around the 16 mark, a massive drop of 33 from the last time. The two phases of polling or voting in Chhattisgarh had happened on November 12 and November 20. 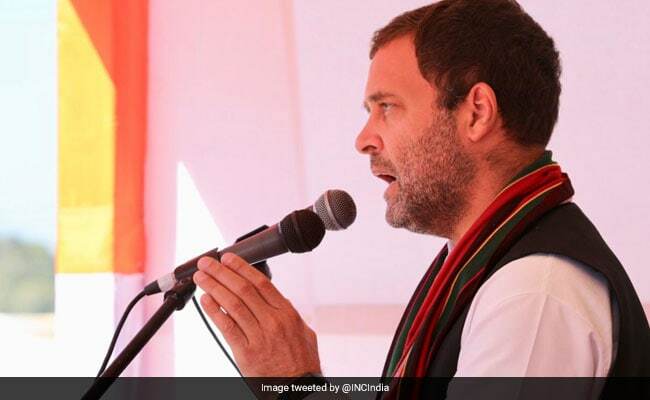 With Congress set to form governments in Chhattisgarh and Rajasthan and locked in a close fight in Madhya Pradesh, party president Rahul Gandhi on Tuesday said the selection of chief ministers in the three states will be done "smoothly". Just In: Chhattisgarh chief minister Raman Singh resigns. He was the chief minister for the last 3 consecutive times. For 15 straight years, people of Chhattisgarh gave me and the BJP a chance to serve them. We did our best, and made a difference to the lives of common man. This election was fought in my name so I take moral responsibility for the defeat. We will form a constructive role in the opposition. Even if I work all my life I will not be able to repay the love and support I have received from the people of Chhattisgarh. These elections were not elections for Delhi, those will be held in 2019. Why will this have an impact on the 2019 polls? We fought these elections on local issues. The 2019 fight will be about who is up against PM Modi. 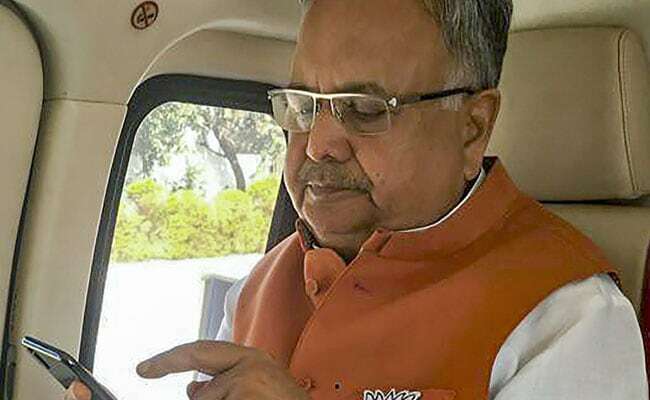 With the Congress poised to wrest power from the BJP in Chhattisgarh after 15 years, the party's state unit chief Bhupesh Baghel has credited strong party organisation for the impressive showing and said he was "not expecting" such a big margin of victory. The Congress was leading in 66 seats, well above the majority mark of 46, while the ruling BJP was a distant second at 14 in the 90-member assembly, according to the Election Commission website. "We were not expecting such a big blessing from the people. We were expecting around 60 seats," Mr Baghel told new agency PTI. The Chhattisgarh Pradesh Congress Committee chief, who is seen as one of the contenders for the chief minister's post along with TS Singhdeo, said it was for the high command to decide who would be chief minister. "The high command will take a decision on this. The responsibility that was given to me, I have fulfilled that," he said. "We strengthened the Congress organisation at the basic level under Rahul Gandhi's leadership and through that we fought the battle for the common man," Mr Baghel added. The party, he asserted, fought for farmers, unemployed youth, women, tribals and traders and won their confidence. The Congress is set to shatter BJP leader Raman Singh's dream of a consecutive fourth term as Chhattisgarh chief minister. #ResultsWithNDTV | ANI images of the deserted BJP office in Raipur. #ResultsWithNDTV | Congress workers celebrate outside party headquarters in Delhi. 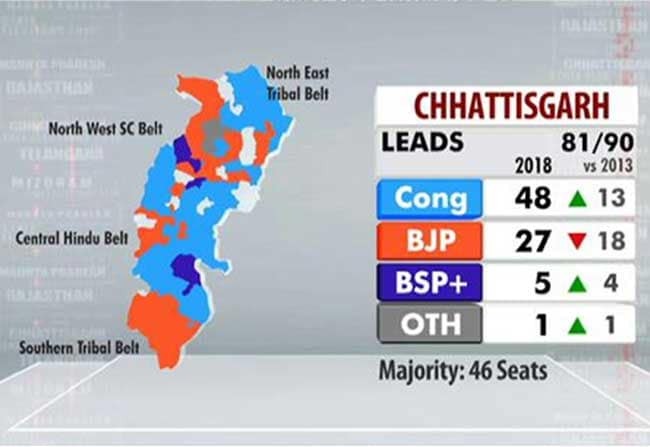 The Congress has taken a massive lead in Chhattisgarh and looks set to stop BJP leader Raman Singh from a fourth consecutive term as Chhattisgarh chief minister. In the 90-member Assembly, the Congress is leading in 67 seats, up 28 from the 2013 polls, while reducing the BJP's tally to a distant second at 17 - a drop of 32 for the ruling party. Five ministers in the BJP government - Brijmohan Agrawal (Raipur City South), Kedar Kashyap (Narayanpur constituency), Mahesh Gagda (Bijapur), Dayaldas Baghel (Nawagarh) and Amar Agrawal (Bilaspur) - were trailing. 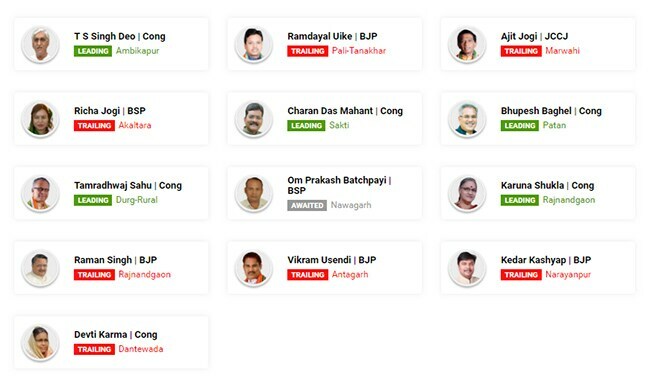 However, state presidents of the BJP and the Congress - Dharamlal Kaushik and Bhupesh Baghel - are leading in Bilha and Patan seats respectively. 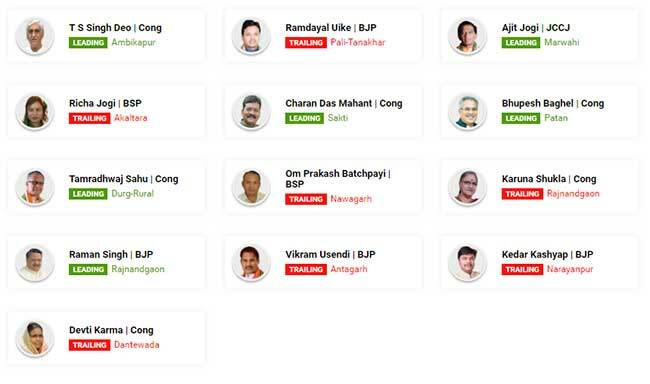 Leader of Opposition TS Singhdeo and Congress MP from Durg Lok Sabha seat Tamradhwaj Sau were leading in Ambikapur and Durg Rural seats, respectively. All eyes have been on Chhattisgarh's Rajnandgaon constituency, which is seeing a big battle between chief minister Raman Singh and Congress' Karuna Shukla. Ms Shukla is former prime minister Atal Bihari Vajpayee's niece. Raman Singh had won both the 2008 and 2013 elections by securing margins of over 33,000 votes each time. 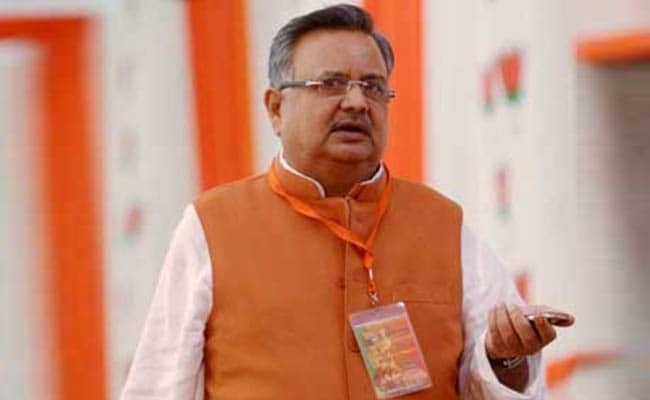 The BJP was taken by surprise when the Congress decided to field former Prime Minister Atal Bihar Vajpayee's niece Karuna Shukla against Chhattisgarh Chief Minister Raman Singh from the Rajnandgaon constituency in the assembly election. For the Congress, it wasn't just about fielding a strong candidate from the seat and giving the chief minister a real challenge. It was about staking claim to the legacy of Atal Bihari Vajpayee, who died in August. "BJP has changed its 'chaal, charitra aur chehra' (ways, character and face). It is no more a party envisaged by Atal ji and (Lal Krishna) Advani ji and people of the state know this," Ms Shukla said while campaigning. Led by Ms Shukla, the Chhattisgarh Congress even went to the extent of marching to the BJP office in Raipur last month demanding that the urn with Mr Vajpayee's ashes be handed over to them. Several such urns had been dispatched to BJP offices across the country as the party organised elaborate immersion rituals to highlight the iconic leader's legacy. Ms Shukla alleged that ashes sent to Raipur in an urn were not immersed by the state BJP unit. The Congress had also accused the BJP of disrespecting both Hindu tradition and Mr Vajpayee. Ms Shukla left the BJP in 2014 after spending over 30 years in the party. She occupied several organisational positions in the party and headed the BJP's Mahila Morcha or women's wing. She was elected on a BJP ticket from the Janjgir Lok Sabha seat in 2004 but lost from Korba in 2009. She joined the Congress and contested the 2014 Lok Sabha elections from Bilaspur, losing by 1.76 lakh votes. This wasn't unexpected since the seat is a known BJP bastion which the party hasn't lost since 1996. Now she is contesting the polls from another BJP stronghold, Rajnandgaon, that too against Chief Minister Raman Singh. Both are invoking the former prime minister's legacy. "Raman Singh calls me his sister. He claims that he is following the ideology of Atal Bihari Vajpayee. As far as I know this (state) government is miles apart from Atal ji's teachings. It is his (the chief minister's) double standards," Ms Shukla alleged. Ms Shukla's supporters hope that she will prove to be a giant-killer the same way Dr Singh defeated Congress heavyweight and former Madhya Pradesh chief minister Motilal Vora from the Rajnandgaon Lok Sabha seat in 1999. Raman Singh is currently leading as votes are being counted today. Raman Singh wasn't the BJP's first choice as Chhattisgarh chief minister when the party came to power in 2003 in the first election after the state was born. But with the BJP's main face in the state, Dilip Singh Judeo, seen taking money on video, the party looked towards Raman Singh, then a minister of state in the Atal Bihari Vajpayee-led National Democratic Alliance government at the Centre. At the time, few would have thought that the soft-spoken Ayurveda doctor would remain the state's chief minister for the next 15 years. Raman Singh is now the longest serving chief minister of the Bharatiya Janata Party, three years more than Prime Minister Narendra Modi's tenure as Gujarat chief minister and two years more than Shivraj Singh Chouhan's years in power in neighbouring Madhya Pradesh. 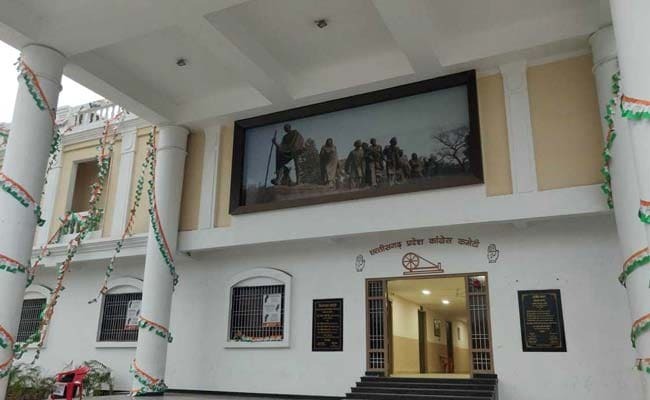 Raman Singh became associated with the Jan Sangh, the BJP's precursor, in the early 1970s in his birthplace Kawardha, then part of Madhya Pradesh. He became the youth president of the outfit's district unit in 1976. He won his first election in 1983 and became a municipal councilor in Kawardha. The year 1990 was crucial for the BJP as it came to power in Madhya Pradesh, Rajasthan and Himachal Pradesh, forming state governments on its own for the first time. Raman Singh won his first assembly election from Kawardha, in what was a BJP wave in the state. Even though the party was defeated in the 1993 assembly elections, Dr Singh won again. In the 1998 assembly elections, however, Dr Singh lost to Congress' Yogeshwar Raj Singh, the young scion of the royal family of Kawardha. In the 1999 Lok Sabha elections, he was given the daunting task of contesting against Congress veteran and former Madhya Pradesh chief minister Motilal Vora from the Rajnandgaon Lok Sabha seat. Dr Singh won the seat by a little over 22,000 votes and came to be seen as a giant-killer. An impressed Prime Minister Atal Bihari Vajpayee, himself from Madhya Pradesh, made Raman Singh the minister of state for commerce and industry. His victory over Mr Vora went in his favour when the BJP was looking for a chief minister in 2003 after the controversy surrounding Dilip Singh Judeo. In a state where Scheduled Tribes and Scheduled Caste together constitute over 50 per cent of the population, Dr Singh, a Thakur, has been unexpectedly successful. He is said to have succeeded in maintaining his popularity through welfare schemes and astute political management. He is also credited with overhauling the public distribution system in the state and bringing the Chhattisgarh Food Security Act, 2012, one of the first food security laws in the country. His rule hasn't been without controversies, with the opposition Congress alleging a Rs. 36,000 crore scam in the state's public distribution system and cornering the chief minister on his son's name allegedly figuring in the Panama Papers. His reign has also seen a number of attacks by Maoists on security forces and civilians, the most prominent one being the massacre at the Darbha valley on May 25, 2013 in which 27 people including Congress leaders Nandkumar Patel, Vidyacharan Shukla, Mahendra Karma and Uday Mudliyar were killed. Seeking a fourth term in office and a third term from the Rajnandgaon assembly seat, Dr Singh is in a curious position. His one-time rival in state politics, former chief minister Ajit Jogi, is unwittingly helping his prospects through his new party Janata Congress Chhattisgarh. The party is seen as a threat to the Congress and could eat into its votes in a number of seats. On the other hand, his "mentor" Atal Bihari Vajpayee's niece Karuna Shukla is contesting against him in Rajnandgaon. If he wins another term, Dr Singh will become the sixth chief minister in India to win four consecutive terms and the first one in a Hindi-speaking state to achieve this feat. The ruling BJP lagged behind the Congress as votes were counted in Chhattisgarh on Tuesday. Three-term Chief Minister Raman Singh of the BJP was trailing in his constituency. As the Congress widened the gap with the BJP in Chhattisgarh, Raman Singh was locked in a tough fight in Rajnandgaon seat, where his rival is Congress's Karuna Shukla, the niece of former prime minister Atal Bihari Vajpayee. Raman Singh is the longest-serving chief minister of the BJP, three years more than Prime Minister Narendra Modi's tenure as Gujarat chief minister and two years more than Shivraj Singh Chouhan's years in power in neighbouring Madhya Pradesh. In 2013, Raman Singh won from the same seat by a margin of 36,000 votes. The alliance of Mayawati's Bahujan Samaj Party (BSP) and former chief minister Ajit Jogi's Janata appeared to make little impact on the Congress's votes. Mayawati's move to tie-up with Ajit Jogi -- a Congress rebel -- was widely predicted to hurt the Congress more than the BJP. Several exit polls had predicted a neck-and-neck fight between the big two and some projected victory for the Rahul Gandhi-led party. The BJP is seeking a fourth straight term in office; the Congress is aiming to return after 15 years out of power in the largely tribal state. In the 2013 elections, the BJP won 49 seats, the Congress 39, while one seat each was bagged by the BSP and an Independent. Just In: BJP is leading in Chhattisgarh, but chief minister Raman Singh is trailing. Just In: Counting of votes begin in Chhattisgarh, four other states. Leads shortly, final result by the evening. 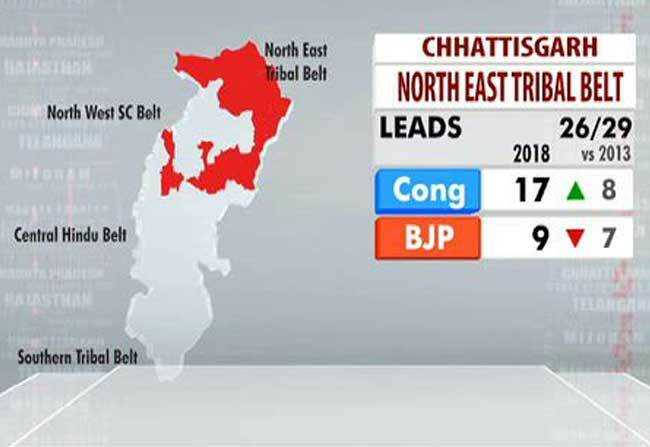 Chhattisgarh Election Result 2018: Will Ajit Jogi Be Kingmaker In Chhattisgarh? The prospect of a hung verdict gives the Mayawati-Ajit Jogi alliance (BSP-JCC Alliance) a crucial role to play in the government formation in the state. Questioned on this eventuality, Ajit Jogi, in a conversation with NDTV's Prannoy Roy said, "In politics you can't rule out anything. So anything can happen". He had however denied to chose a preference between the BJP or the Congress. While the BJP eyes a fourth term for the Raman Singh government, an aggregate of 10 exit polls predicted a hung assembly where the BJP, with 41 seats, would fall behind the Congress, which will get 43 seats. Poll's prediction, however, does not give either parties a clear majority. The majority mark in the 90-member assembly lies at 46. #ResultsWithNDTV | Prannoy Roy explains exactly why #AssemblyElections2018 are important. Chhattisgarh Election Result 2018: What Time Will Counting Of Votes Begin? When Will The Result Be Known? Counting of votes will begin at 8 am, and the result should be known by early evening. While Raman Singh is the chief ministerial candidate of the BJP, Ajit Jogi is the chief ministerial candidate for the BSP-JCC alliance. The Congress has not named its chief ministerial candidate. BJP's Raman Singh, who has been in power in the state for three successive terms, is looking for a historic fourth term as chief minister based on his "good governance" model in the state. Chhattisgarh is fighting a three-way battle between the ruling BJP, the Congress and the Ajit Jogi-Mayawati-led alliance. 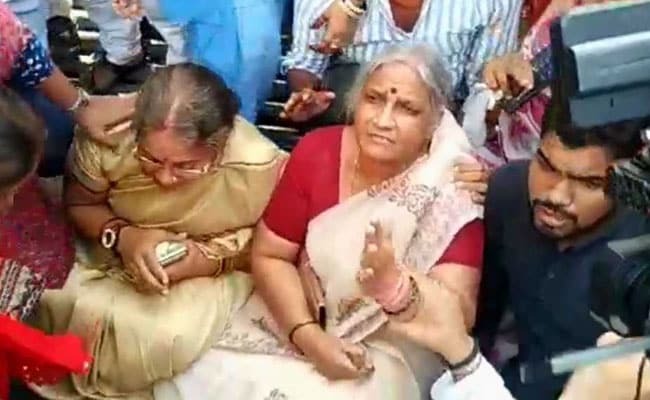 The Congress has fielded former prime minister Atal Bihari Vajpayee's niece Karuna Shukla against BJP's Raman Singh in his home turf. The two phases of polling or voting in Chhattisgarh happened on November 12 and November 20. The first phase, where 18 constituencies went to vote, saw a voter turnout of 76.35 per cent. The second phase, where the remaining 72 constituencies went to vote, saw a voter turnout of 76.34 per cent. There was an average overall turnout of 76.35 per cent in the state. 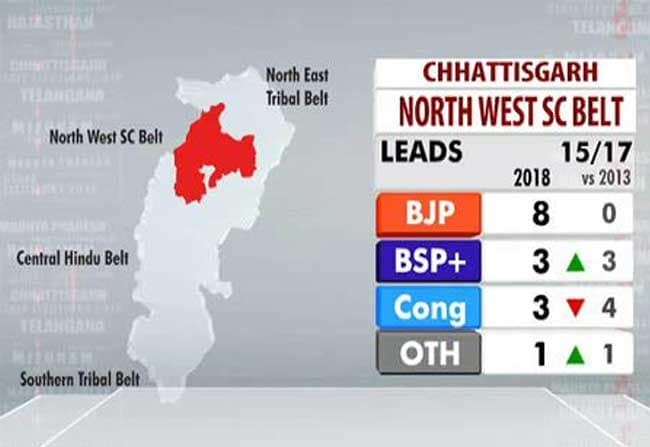 Chhattisgarh, which voted in two phases to elect a new government in the state, will know who will win the three-way battle in the state with the result being announced today. The Chhattisgarh Assembly has 90 members. Good morning. Results for the assembly elections in five states - Chhattisgarh, Madhya Pradesh, Rajasthan, Mizoram and Telangana - will be declared today. 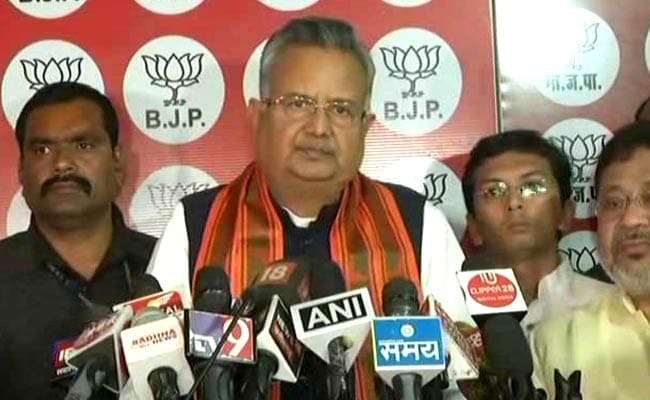 This live blog will get you the latest updates from Chhattisgarh, where BJP's Raman Singh is looking for a fourth successive term as chief minister. Will he make it? Or will the Congress be able to stop him? Will the Ajit Jogi-Mayawati alliance play the role of a kingmaker? Let us see how things unravel in Chhattisgarh.